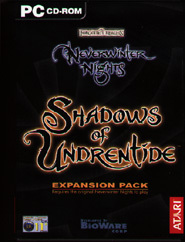 'Neverwinter Nights continues the epic-roleplaying game revolution with Shadows of Undrentide, the first-ever expansion pack for the award-winning fantasy game. Engage in an all-new 20-hour adventure filled with new character classes - including five Prestige classes - monsters, weapons, feats, skills and spells! Visit the official Neverwinter Nights: Shadows of Undrentide website!